July | 2016 | Mike Lamberti, From Margate To Cleveland, And Back ! For a Coach who saw more in us; More than we thought we could ever be. Who taught us to discipline the mind and the body that we are in. Who raised expectations and dreams. Beyond just an athlete’s schemes. Beyond normal endurance. Beyond ourselves and ever since. We are greater people for it. Because you taught us about chasing greatness. 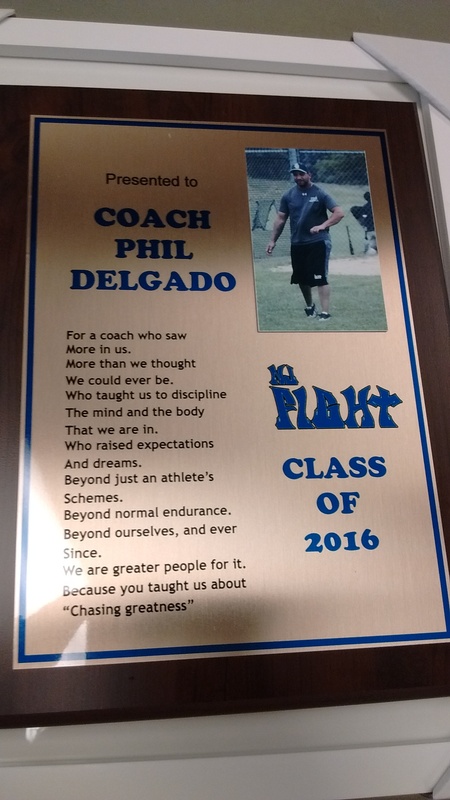 Phil Delgado is as self-deprecating as one can be, when it comes to any coaching successes he’s enjoyed in the sport of high school softball. Delgado led a young Montclair team to an unlikely berth in the Essex County Tournament finals in 2016. And the always-kinetic coach took that salvo into the summer time, where he’s guiding a fledgling program in NJ Fight to a great deal of success. Delgado’s Thursday night summer practices in Nutley are legendary. Between blaring music, you’ll see him running from one station to another, usually wearing some kind of baseball cap, sometimes on backwards, encouraging, occasionally yelling, but always upbeat. He’ll tell you he has the attention span of an infant when it comes to a mistake a player makes in a game. One minute, he’s fuming, next minute, he’s moved on, usually laughing about something else. It’s the excitement and genuine sincerity which a high school kid will pick up on, first. One thing is true, you can’t fool most kids when it comes to being someone you’re not. So when the 12 oldest players on NJ Fight, the ones heading to college in a few weeks, gathered on July 21 for a farewell party, prior to practice, Delgado admitted this was going to be tough. “I don’t usually get emotional,” he said to a large crowd of parents, friends and players, ages 10-18. “But these kids were great. And now they’re moving on. They’re getting a chance to play in college. Fifteen kids (12 seniors, three others committed, but still in high school). Not bad. “And you know why they’re playing? Because they wanted it. They weren’t going to be told they can’t do something. I tried to help, but it’s about these kids doing the right thing in the classroom, on the field and, in general. That’s a testimony to their parents. I’m just appreciative for the trust instilled in me, by those parents and subsequently, their kids. Delgado often kids about the imaginary ‘Island’ that he actually enjoys being on, when it comes to coaching. I’ve called it PDG Island. Always a good day on PDG Island. (Click on photos for larger images). The 12 outgoing seniors sat at a table up front in the air-conditioned recreation center, in Nutley. And Delgado spoke about each kid, recalling a few moments and how that young lady is now preparing for college. He pointed out some going to school for Pre-Med, a Physical Therapy Doctorate program and others who will pursue Business and Education majors. He spoke about Leyri Rivera (Post University), Erica Robles, who played for him at Montclair High and NJ Fight, who is going to the University or Rhode Island, Izzy Hilling (Felician), Blake Saperstein (Montclair State), Sabrina Torres (Rider University), Amanda Schweitzer (St. Thomas Aquinas), Breanna DeMaio (Felician, where she’ll study to be a doctor), Emma Hesse (Manhattan College), Kate Jencarelli (SUNY-Oneonta, with the ultimate goal, Cornell), Torey Casey (Babson College), Emily Holden (Ithaca College, Doctorate program for Physical Therapy) and Caileigh Holland (Rhode Island). Delgado and the 12 outgoing seniors. Delgado recalled the early days of coaching for him, working with Sergio Rodriguez, a successful coach on the circuit with Newark Academy High, and in the summer, the Heist. He was especially poignant in recalling the legacy and inspiration of the late Anthony LaRezza. The seniors presented Phil a poster of the schools they’ll be attending this fall. (Click on photo for larger image). “He’s with me every day,” said Delgado of the Immaculate Heart Academy legend. When he was done, the girls spoke. Many choked up in recalling the sisterly bond that NJ Fight provided them. 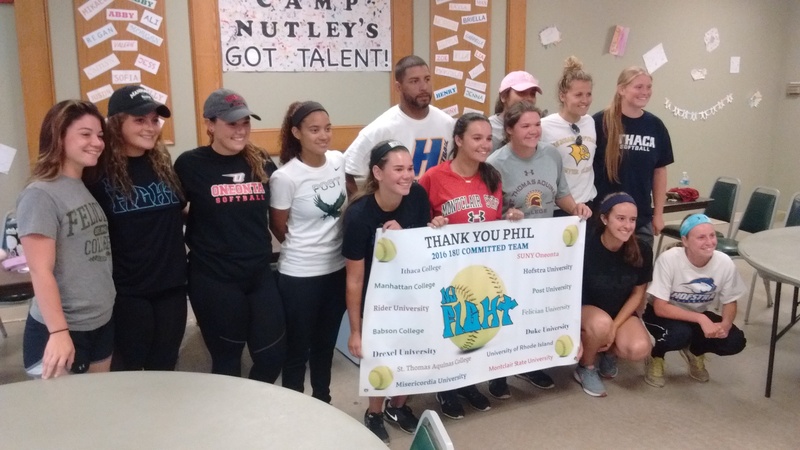 Phil was presented some great gifts by the girls, including a banner, with a list of the 14 colleges and universities the players will attending, and a plaque. The future of the NJ Fight team was in attendance, too. Delgado urged the 16, 14, 12 and 10-U players to remember what the graduating players meant to a program that’s just, really, a year in existence. Delgado pointed out a few underclassmen who have committed to colleges for 2017 and beyond. Everyone applauded. And when it was done, everyone in the big room stood and cheered. It was indeed a nice ending to a tremendous summer campaign. The plaque, presented by the players to Delgado, says it all.